Struggling with UCAT preparation? In this post, we explain how to solve UCAT situational judgement problems. 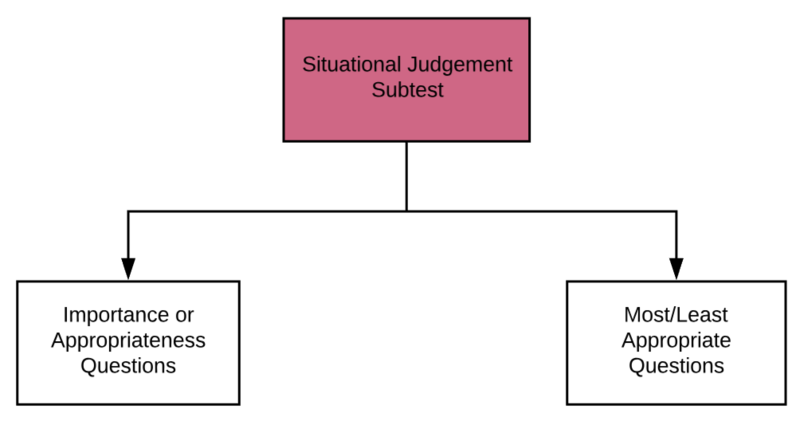 What is Situational Judgement in UCAT? The UCAT Situational Judgement Test (SJT) is the last of the five subtests. It’s used to measure an applicant’s ability to understand situations in the real world, identifying key factors, and recognising the appropriate response to deal with them. Why is Situational Judgment tested? The SJT is used to select medical and dental students around the world because it assesses key attributes for a successful medical professional – empathy, adaptability, integrity, resilience, and team involvement. What is the format of the Situational Judgment test? This subtest is one of five subtests within the UCAT and comprises of 22 different scenarios accompanied by 69 questions which must be completed in 26 minutes. You will score the most marks by selecting the correct answer but you’ll also be given marks for being close to the correct answer. The test involves reading scenarios with possible actions and considerations and answers need to be submitted through a ‘drag and drop’ method. Answering the questions do not require medical knowledge. What are the types of Situational Judgement questions? After a long day at work and finishing later than usual, you drive home in a tired state. As you are approaching your house, the neighbour’s dog appears to have escaped because it has run out in front of your car. You swerve quickly but unfortunately did not miss the dog. You quickly park and jump out and see that the dog is walking away but limping badly. It is clear that it has badly injured its leg. A is correct. It is important to display honesty and acknowledge and address when mistakes or accidents are made. In this case, there is no suggestion that you are at fault or there was any malice. However, you should speak to your neighbours and inform them of what’s happened and see what action to do next. The answer is therefore very important. D is correct. Calling the police line is for emergencies only, and despite the dog being injured, it is not appropriate to dial 000 for the accident with the dog unless you or another person was in a position of danger or unsafety. It is therefore not important. A is correct. The dog is injured and will require assistance or need to be looked at. It may be in pain or have injuries that need to be looked at urgently. It is, therefore, appropriate to seek help at the earliest opportunity, and calling the vet hospital is the best way of doing this. The response is, therefore, very important. C is correct. You should check your car at some point as it may have damages that may make it dangerous to drive however it is not the immediate concern at this stage nor the first priority. Therefore the answer is of minor importance. You are a medical student in the third year of your course. As a part of your degree, you attend the local hospital. It is early Thursday morning and you assisting one of the doctors on their daily schedule with their patients. Doctor Roy has just finished taking x-rays and examining a middle-aged man, Carl. After the examination, you read Dr Roy’s notes and see that he has noticed some irregularities in the patient’s stomach. The patient had been taken for further tests but the results from this test are not yet available. Dr Roy has left to attend to another emergency, and the nurse approaches you and says Carl is getting frustrated with the wait and has left and wants to know if there are any issues with him leaving the hospital and coming back at a later date. The nurse has advised you that Carl is upset with the long wait and was going to leave unless someone advises that there are any issues otherwise. You ask the nurse to tell the patient that as you are a training medical student and that you are not allowed to disclose or advise of any information. As a medical student, it expected that communication skills are pivotal to the profession and all students are expected to act professionally within their capabilities at all times. Asking the nurse to pass on information is shirking all responsibility and not dealing with the patient or acting in their best interest. Although you should not disclose any information or advice of results, you should approach the patient yourself to explain the importance of waiting until the doctor is available, or at least have a conversation to relieve some of their frustration and understand their concerns and expectations and help them resolve the situation (i.e. is it a possibility that they wait longer until further directions / how urgent is their reason for leaving etc). Therefore, the response is very inappropriate. If a patient is in some sort of risk or if there is great uncertainty, it is necessary to involve a senior member of the medical team to speak to the patient and address their concerns to try to reach a solution and prevent any issues or putting the patient at risk. This is a very appropriate response.